I know everyone thinks their mom was the best and I’m no exception. Prudence La Bay Bedford left this world a few years back yet her impact is still felt. She probably would gave preferred a good cup of coffee to wine, but I wanted to make something to celebrate her life and was worthy of her stature. 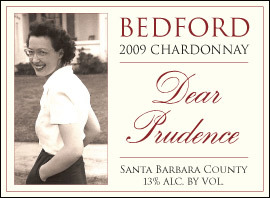 The 2009 Chardonnay “Dear Prudence” is the Grand Dame of Chardonnay. This wine is dedicated to all the moms out there that have lovingly guided our lives – even when one of their kids burns a hole in her carpet for a science project. The Chardonnay from Los Alamos has an alluring tropical fruit character, a wonderful viscosity, and a great acid structure that sets itself apart from Chardonnays from other areas. So when I wanted to make a special edition that was distinctive and had regal bearings, I didn’t have to go far. I selected three barrels that stood out from the vintage and, along with a complete barrel fermentation and malolactic fermentation, they were allowed additional time in barrel sur lies, in approximately 30% new oak. This accentuated the texture without over oaking it. Consequently, the wine has fresh fruit elements in the nose along with the complexity and richness barrel age supports, and that will increase over time. The crisp acidity makes it a favorite with Dover sole or cracked crab. Enjoy now but the wine will continue to evolve over the next few years. Only 90 cases made. Consider this our reserve Chardonnay with the class of a Grand Cru Chablis. It is a tribute to Stephan’s late mom, Prudence Bedford, but really it’s a tribute to all moms everywhere. Only 90 cases were made of the 2009 Dear Prudence. The photo on the label is Prudence on the day Stephan’s father proposed to her. You are currently browsing the Bedford Winery blog archives for September, 2012.